Laura Burns (The Sarstoon Temash Institute for Indigenous Management - SATIIM): For her undergraduate studies, Laura attended the University of Wisconsin-Madison where she majored in International Studies and Environmental Studies. At the time of her fellowship, Laura was studying International Development at the Josef Korbel School of International Studies, Denver University, with a concentration in Environmental, Sustainable Development in Latin America and Humanitarian Assistance. Laura has volunteered for sustainable ecotourism in Costa Rica, and In Ecuador for Fundación Runa, a fair trade organic tea company. 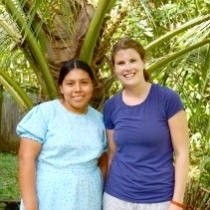 After her fellowship Laura wrote: "The best aspect of my fellowship was, by far, working with the women of Santa Teresa. I feel very fortunate that I was able to spend time with the women. I was reminded that what I enjoy most is really talking to people, listening to what they have to say, and sharing it with others. I was reminded that sometimes, it just takes a person willing to share that story, to make someone feel great." Anyone that knows me marginally well knows that I am the furthest thing from crafty.